Posted on Wed, Feb 1, 2012 : 6 a.m. In Michigan, the conversation about gardening in winter is usually focuses on seed catalogs, plans for spring or houseplants. A warm January day like yesterday, however, with the bright sunshine and the pleasant temperatures, makes us feel as though we could be gardening. What can gardening can be done successfully when the warm weather bug strikes? There are actually a few gardening tasks that are great for a warm day when you want to be outside. You can get ahead of the weeds of spring by pulling up weeds visible in the garden beds now. Use a garden fork or a trowel to loosen the weed. Weeds can be put in home compost, if yours gets hot enough to kill seeds, or a yard bag for curbside pickup. It’s good to keep in mind that many weeds have longer growing seasons than the plants cultivated in the garden on purpose. Some green up earlier in the spring and others seem to live on into fall or winter. We had a couple amazingly green uninvited plants in the vegetable beds who appeared to be growing fine even in winter. Keep in mind, however, that weeds are thieves. Even if weeds aren't particularly large or unsightly, they are enjoying a free lunch in your garden bed and eating up nutrients that could otherwise be feeding your vegetables, herbs or flowers. One important caution should be observed when mucking around in the garden in winter or early spring. You want to take care not to work the soil when weeding. You don't want to compact the soil or otherwise disturb the soil structure. Likewise, stay on pathways and avoid stepping on garden beds altogether. Why not enjoy the fine weather with a walk around the yard or garden while you gather up fallen branches and twigs? Here's another task that you can get a head-start on and make less onerous in spring. It’s also a good time to consider pruning fruit trees and woody shrubs. Since I'm no expert, let me direct your attention to an article from the MSU Extension like Proper pruning means healthier, more productive fruit trees. There are many articles about pruning available online and in books. Good tools and a good guide will help with this task. 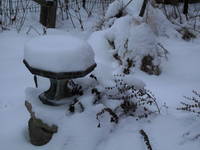 Winter is also a great time to observe your yard or gardens carefully. You might note any stems or stalks you left to overwinter and decide if you like the way they look in the snow landscape. You can also see the planes and surfaces of your garden and consider where you might want to add height or interest with a plant or a trellis. You can also pay attention to the "warm spots" in your yard by observing in which areas the snow melts first. The advice I've heard is that those warm spots are the best places to plant bulbs because they will get an earlier start than if planted in the places in the landscape that stay snowy longer. Make a note or mark the spots so you remember where you want to plant new bulbs. All in all, it's really not that long until real spring will come to Michigan. In just two months, some gardeners I know will be planting peas. A little work now — when the weather permits — will make next year's garden healthier and more productive. Tried but failed to get any of my leeks out of the frozen ground Monday - maybe today. Most years I'd have parsnips still waiting out there too. It's nearly time for me to start seeds (inside) of some new spinach. I have some over-wintering too. Most of my work this time of year is volunteering, usually for the DNR (search &quot;Michigan DNR volunteer opportunities&quot;) but there are many other worthy stewardship projects (stewardshipnetwork.org). In winter it is mostly fighting invasive woody plants in high-value areas (autumn olive, honeysuckle, common and glossy buckthorn, and more). I owe the state land more than most, since I eat deer, shrooms, berries, in addition to many non-consumptive uses. Meet cool people, learn stuff, do good things for the land you love, and get a workout. Oh, the DNR get's matching funds for your volunteered time too.